The time has come for the real Spring flowers to start showing themselves in our gardens in Nova Scotia. I say “real” because, although there are others that bloom earlier, the flowers blooming now are ones that only appear after the snow. Two common examples of what I mean by the above are Aconite (with its green frill and buttercup-like blossom), and Snowdrops. Both have no problem pushing up through the last of the snow to give us cheer in very early spring. Lungwort are different. They wait to show their small sweet blooms. Besides springtime cheer they offer another advantage. Unlike many spring flowers, the foliage lasts through a large part of the growing season. After the blossoms fade the leaves can grow to a considerable size, rivalling a small-leaved Hosta we have in our back yard. Lungwort goes by many different names. Other common ones are Jerusalem Cowslip (or J. Sage), Oak Lungs, Lung Moss and Spotted Comfrey. The term “spotted” is obvious when you see the leaves. They look exactly like someone cleaned a white paintbrush above them and dropped watery/paint blotches all over the plants. 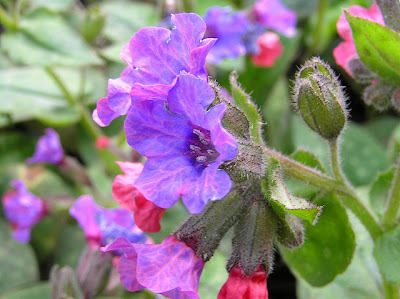 Lungwort belongs to the botanical family Boraginaceae. This family also includes Forget-Me-Nots, Bugloss, Comfrey and Borage. It is native to Europe and western Asia. Garden centres now offer many interesting varieties of this semi-unknown plant. 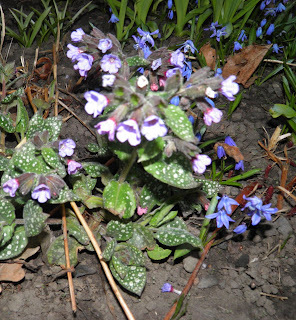 Lungwort is a perennial. It grows up to 20 cm high and has hairy, oval-shaped leaves. Small flowers appear in clusters at the end of the stems. They open red/pink at first, but turn pink-purple to blue as they mature. In Nova Scotia flowering occurs in mid-April. It prefers somewhat moist shade or semi-shade as full sun will cause it to be a bit “droopy,” especially in summer when all you see is the leaves. 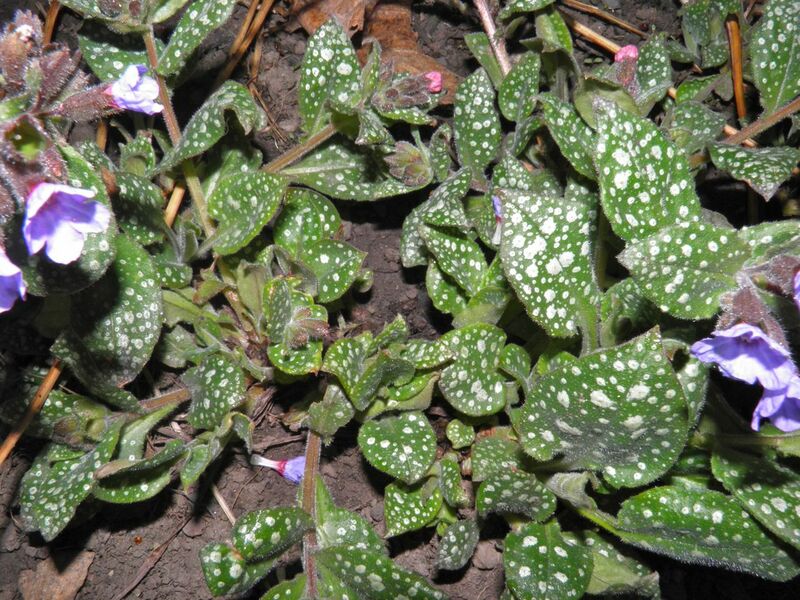 Lungwort is extremely hardy, being able to withstand temperatures associated with USDA Zones 2 or 3. Lungwort is very easy to divide. Simply dig it up and pry apart the plants. This should be done only in spring after it has bloomed or in the fall. If doing it in the fall, make sure you leave enough good weather ahead to let them settle in before frost and snow. Lungwort - as its name suggests, has been traditionally used as a remedy against various lung disorders including tuberculosis, asthma and coughs. Lungwort is a very good astringent, demulcent, diuretic, emollient and expectorant. The main substance responsible for its beneficial actions on various lung complaints is mucilage. It can help in treatment of chronic bronchitis, chronic cough, whooping cough and sore throat. Lungwort is sometimes recommended for gastrointestinal and kidney problems. Used externally, it can be very beneficial in treatment of burns, eczema, hemorrhoids, wounds etc. If you just intend on enjoying this plant in your garden, I would suggest it wholeheartedly. Over the 16 years it has been in our garden it has proven to be a dependable repeat visitor. I would suggest a top-dressing of manure later in the season to ensure you get the most enjoyment from this beautiful little plant the following year.